"It was nice to find a vet that knew about dumbo rats. I felt like my little guy was in good hands." Dr. Brown graduated in 2011 from the Royal Veterinary College in London and worked in a small animal practice in England for three years and then in private practice in the United States before joining the Animal & Bird Health Care Center this year. 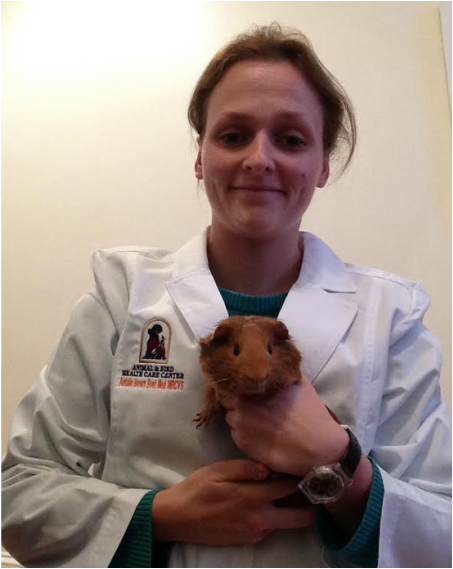 Dr. Brown undertook a post graduate veterinary certificate in exotic animal medicine and would like to eventually develop this further and become boarded in small mammal practice. Dr. Brown is a member of both the AVMA and the Association of Exotic Mammal Veterinarians (AEMV) and work hard on keeping up to date with new research and developments in the veterinary field. Dr. Brown enjoys seeing a wide variety of pets with my main interests being in small mammals and reptiles. She has two guinea-pigs at home, Yoda and Vader, who usually have free roam of the apartment (and are improving with their litter training!). In her spare time she is a keen runner and is working on improving her marathon time and running longer distances.